The Living Skies Come Alive International Fireworks Competition is over for another year, but many more events are coming up in the area this weekend. The 19th annual Whitewood/Chacachas Rodeo is set for Friday, Saturday and Sunday at the rodeo grounds just east of Whitewood, the McAuley Hoedown is coming up Friday and Saturday in McAuley, the Spy Hill Sports Days and Rodeo is set for Saturday and Sunday at the Spy Hill Sports Grounds, and the Fleming Jets are celebrating 50 years and hosting a reunion Friday, Saturday, and Sunday. The Whitewood/Chacachas 19th annual rodeo starts Friday with rodeo action beginning at 7 pm, mutton bustin going at rodeo intermission, and beer gardens from 5:30 pm to 2 am. On Saturday, things kick off with a pancake breakfast at 8 am, followed by a kids and youth rodeo at 10 am, and a rodeo performance at 7 pm, including wild pony races at intermission, and beer gardens. Classy Knights Interactive DJ Service will provide entertainment from 10 pm to 2 am in the beer gardens both Friday and Saturday. Sunday’s events include a pancake breakfast at 8 am, Cowboy Church Service at 9 am, Saskatoba Riding Club Gymkhana at 10 am, and English Equestrian jumping demonstration at 2 pm. The McAuley Hoedown kicks off with the ranch rodeo Friday night at 7:30 pm. Slowpitch goes Friday evening and all day Saturday, and the beer gardens will be open all weekend. Saturday kicks off with the RM of Ellice-Archie pancake breakfast from 9 am to 11 am. The slowpitch continues on Saturday and a kids area will be set up all day Saturday. The McAuley Fire Department will host a barbecue lunch from noon to 3 pm Saturday. On Saturday evening, the McAuley Country Cafe will be hosting a supper, and the weekend will end off with a social Saturday night. For the second year, the Spy Hill Sports Days includes a full rodeo in addition to the chuckwagon and chariot races that have been part of the Spy Hill Sports Days for years. 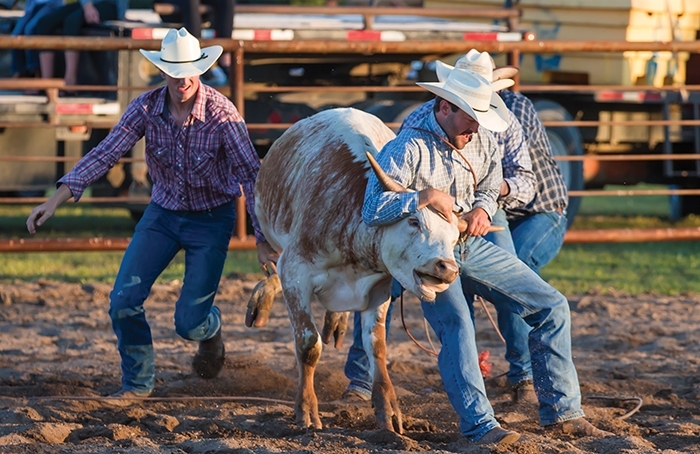 There are two full days of events at this year’s Spy Hill Sports Days and Rodeo. Rodeo action goes from 1-3:30 pm, and there will be sheep riding and wild pony races during intermission. There will be a pulled pork supper at 4:30, and chariot and chuckwagon races begin at 5 pm. There will be slowpitch and beach volleyball all day, and Saturday will wrap up with entertainment by Borderline in the beer gardens. Sunday starts off with brunch at the curling rink from 8 am to 11 am, and rodeo slack is set for 9 am. Rodeo action is set for 1 pm Sunday, and chariot and chuckwagon races go at 4 pm. There will be slow pitch and beach volleyball all day Sunday, and Sunday’s events will wrap up with a chicken supper at 4 pm. There are some events open to the public at this weekend’s Fleming Jets reunion. The pancake breakfast from 7-10 am on Saturday morning, hosted by the Moosomin Fire Department, is open for anyone to attend. The beer gardens are also open to the public, as is the dance Saturday night. Former players are returning for the reunion, which includes socializing on Friday evening, an alumni and families slowpitch game at Green Acres Ball Park at 1 pm Saturday, the reunion ceremony and photos at 4 pm, a barbecue pork supper Saturday at 5 pm and a dance from 10 to midnight Saturday. On Sunday, reunion attendees will get together for a final round of visiting at 10 am.